Start scouting around the time when emergence should occur. 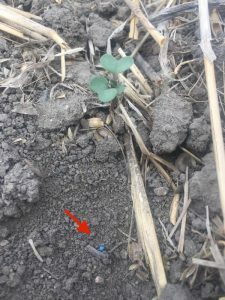 Normally by late May, warm soils, decent moisture and 1” seeding depth should produce emergence be about a week after seeding. However, dry conditions can delay emergence. Scouting step 1. Count plants and relate that to seeding rate. Use the Canola Calculator plant survival calculator. 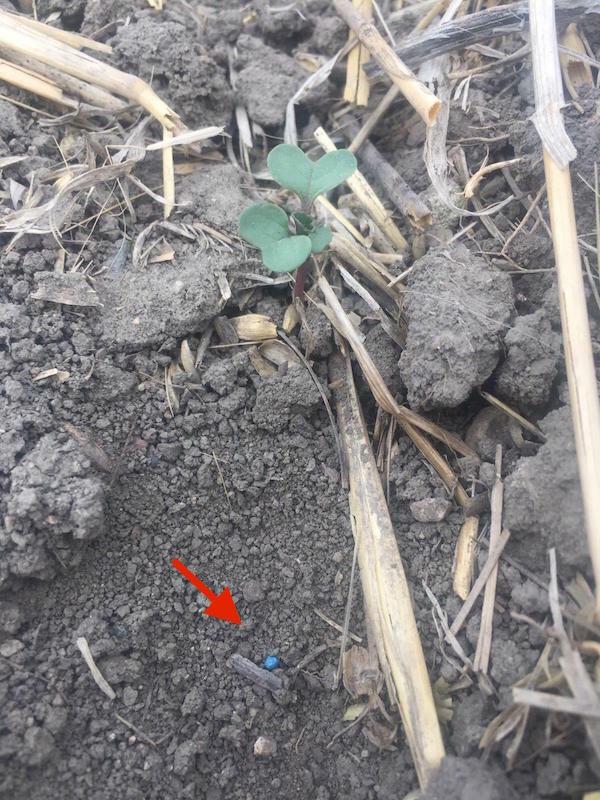 Seedling diseases, flea beetles, frost and other factors can influence seed survival, and unless scouting and counts are done repeatedly through the first few weeks after seeding, these influences may be missed and the seeding tool or other seedbed conditions may be unfairly blamed. How to use a hoop to do plant counts. NOTE: When doing plant counts, be sure to subtract volunteers. Plants growing outside the seed row are likely volunteers. Very early looking plants are also likely volunteers. You can check by looking for the blue seed coat around the seed. Insect damage. Flea beetles are usually the most serious insect pest this time of year. Examine newer leaves for recent damage and look for stem feeding. Note that canola seed treatments require a bit of feeding to stop flea beetles, so older leaves may show some damage for this reason while newer leaves may be undamaged – indicating the crop is growing ahead of the feeding and a foliar insecticide application is not likely needed. READ MORE on flea beetles. Cutworms can also remove young canola plants. Look for bare patches and dig around the perimeter of the patch to look for cutworms just below the soil surface. READ MORE on cutworms. Weeds. Early-season weed competition is the most costly to yield. If fields did not get a pre-seed burnoff, expect to see some weed competition and spray them early in the window. Earliest spray opportunity varies by HT system. Herbicide damage. Carryover of residual products from last year can be a concern in dry conditions. Mistakes with pre-seed burnoff products can also cause damage. Fertilizer damage. This can be difficult to diagnose but higher rates of seed-placed fertilizer in dry soils and with low seed-bed utilization (narrow openers and wider rows) can cause seed and seedling mortality. Seeds that are dried up and powder-like inside may be fertilizer damaged. Residue. Thick or uneven residue can have implications for frost damage and reduced seeder performance. With regard to frost, residue means the soil doesn’t warm as much during the day and doesn’t release its stored heat as quickly during the night. Seedlings growing up through heavy residue can therefore be more susceptible to frost. Another factor is that seedlings growing up through residue tend to have longer more exposed hypocotyls.